Had gone to Mumbai over the weekend, my mother talked me into watching this movie on Saturday night. Since I did not have anything else to do except visit my ophthalmologist, I complied. It has been over 4-5 years since I have watched a marathi movie in a theater. And I was pleasantly surprised with the new age of marathi movies coming. 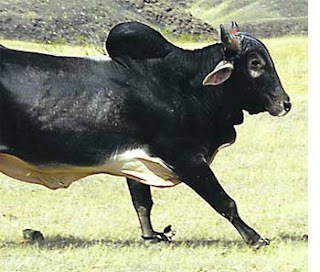 Valu in marathi means a bull which is unleashed in the wild, it is not to be tamed and not to be tampered with either. So the movie starts off with a no-nonsense forest officer who is dispatched to capture a rogue wild bull who is disturbing the peaceful proceedings of some nondescript village. The forest officer is miffed at this prospect, that such an important person like him is now relegated to capturing wild bulls instead of leopards and their ilk. Nonetheless he goes there, along with him, comes his younger brother ... and his video camera. The entire movie is about different perspectives from different villagers about one problem. A wild bull. If you do understand marathi, then definitely worth a watch. What is more interesting, is how the movie was made. The producers of this movie are not your regular Sippy's and Bokadia's ... they are not even millionaires, they are simple middle class people like you and me. The aam aadmi of Maharashtra. How did they come up with the moolah? Well, through their friends, relatives and friend of their friends. Talk about Movie 2.0, huh?